PETCO: Goldfish Rights? Activist Employees? What Gives? Last week, as a long-anticipated reward, my nine-year old son and I visited your store in Manassas, Virginia. 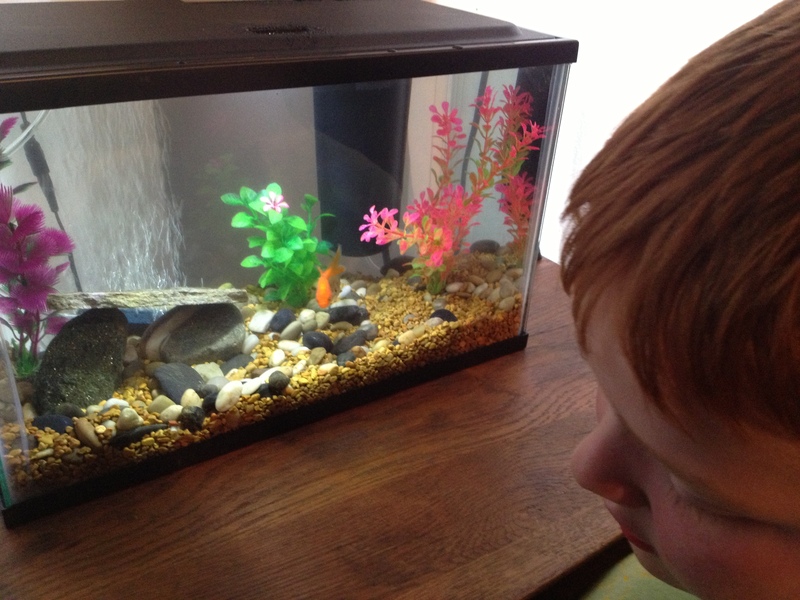 My son has Autism and Sensory Processing Disorder, and is fascinated with fish. To reward his hard work in 3rd grade, we purchased an aquarium kit from the store. A helpful employee advised us as to set-up and the necessary time for the tank to be hospitable for fish. My son began the five-day count-down, eagerly awaiting when we could return and purchase two small goldfish. On Thursday afternoon, with an excited child, I returned to PETCO and requested help from an employee at the front desk. My son ran ahead to try and find the two fish he wanted. [Redacted], who identified herself as an Aquatic Specialist, joined me on the way to the fish department. I told her we wanted two small goldfish ($2.99 each), at which point she asked the aquarium size. When I informed her it was five gallons, she stopped and informed me she could not sell me goldfish. Stunned, I asked why. She told me that since goldfish grow to ten inches, I would have to have a tank that could accommodate such a fish. Incredulous, I explained to her that I had purchased the entire tank system only last week, and I had been clear with the previous employee that we intended to buy two small goldfish. She informed me, in her opinion it was unethical to put two goldfish in a five gallon tank, because they would grow larger. I stood agog in the fish department, while my son continued to press his face to the blue tanks in anticipation of his new fish. My son was still blissfully ignorant of the conflict— children with autism often struggle with change, and this was an event he had been anticipating with great joy. Through rising tension, I told her I would simply purchase a larger tank if the fish grew too big, but for right now, two 2″ fish in five gallons of water was reasonable. She self-righteously stated that was not acceptable, and refused. I have never been so angry in a store. There are two issues here: the incredible lack of anything resembling customer service, and the reality of a child on the autism spectrum now having to process and adjust in a store where he is refused the very goal that same store (and his mother) promised a few days earlier, following very specific directions. I spent a fair amount of money on the tank set-up and supplies, and I returned to PETCO out of loyalty to buy our fish. Instead of a friendly experience, we were shamed and more care was shown for the well-being of a two-inch fish than was shown for my child, and for me as a customer. It’s unclear if this is a company policy or the actions of a misguided activist employee, but the damage done to my goodwill is substantial, and PETCO today lost our business. A clarification as to PETCO’s policy would be appreciated. Do customers need to bring in photos of their aquarium and be vetted? Is there an application for purchasing a fish? Does one have to sign an affidavit promising to upgrade aquarium size? Based on this employee’s assessment of my son and I, we were discriminated against by PETCO. Training for employees in customer service, particularly [redacted], is not only prudent, but clearly necessary, unless you wish you lose more customers. p.s. Thankfully, we were able to find a local aquarium store where they were helpful, kind and delighted in selling us two small goldfish and additional supplies. Their employee also gave my son a lesson in caring for his new fish. Oh my! I can hardly believe your experience. I am so glad that you found someone who was willing to sell you goldfish and especially someone who taught Bean how to care for them. I can remember buying feeder goldfish at Petco to give to our oscar. If they sell fish to be eaten by other fish, what’s the problem with selling a fish for a child to learn to care for? Add to the fact that their own display tank do not adhere to those water recommendations. If five gallons of water is not enough for two goldfish, how is it possible they have dozens in what appear to be 15 gallon tanks? Hi Tracy: I have received poor customer service at a Petco here in Los Angeles. I now take my business to Pet Smart. A WORLD of difference. Obviously the customer service issue is a nation-wide problem. i am so sorry for your sons initial disappointment, but happy to hear that it worked out elsewhere. I too am eager to read Petco’s reply! My best to your son and his new friends! Shall we spread this on FB until news media pick it up, or do you want this to remain quietly between PETCO and you? I’m eager to read PETCO’s response. Spread away. It’s a ridiculous policy. What about feeder fish? A friend on facebook said at PETCO if you’re buying a feeder mouse for your snake, you have to give your veterinary info for who will be caring for the mouse. Nevermind it’s going to be EATEN ALIVE in ten minutes. Share all you want. Speechless – and that’s hard to do. As far as I understand fish will only grow as big as their environment allows them to. So while goldfish could get up to 10 inches long, if their tank would not support that they wouldn’t grow that big – but I could be mistaken. That is so rude and beyond annoying with the inconsistency! PETCO needs to teach their employees some marine biology. Fish only grow to a size that accommodates their environment, usually about one inch of water surface to one inch of fish length. Goldfish are different, their bodies may stop growing but their insides don’t, causing them a horrible death. Emily, you can see my video of the fish on the post following this one. These are feeder fish that were destine to be turtle food. I refuse to believe a few years at our house is a worse outcome. Also, Petco Headquarters in San Diego verified that my setup is appropiate for the two small feeder fish. That employee is such a pompous _ss. We had two goldfish in a 5 gallon tank for 6 years. While for several of those years it was just one, it NEVER GREW BIGGER! hahaha Your lesson learned here is to find the mom and pop store to give your business. There are drops you can get that make the water immediately ready for the fish to survive. My brother had one goldfish in a tank, and it grew huge. But is it the stores business what you do with your fish when you get home? Nope. So I say never shop there again. I’m at a loss for words too. You’re much better at articulating the issues than I would be. I used to keep a 1.5 gallon fishbowl around for the inevitable bags of fish that came home from the school carnivals. We’d name the poor creatures and put them in the bowl for me to feed and periodically clean. I didn’t forget them. They fulfilled the measure of their pethood by being pretty to look at and eagerly rising to the surface when food was sprinkled. In return they had clear, dechlorinated water. When they died, we gave them a coffin that fit and a decent burial. Good luck to Bean and his new pets. This is so weird. We had the exact same experience at a Petsmart last week. “Buy this tank… Go home. Set it up. Come back in 3 days for 3 guppies…” Went back and a different employee informed us that 2 guppies were stretching it but she definitely couldn’t sell us 3! Crazy. Are there new fish laws or something??? Glad you wrote a letter! The employee was well within her rights to refuse sale of a fish if she thought you were going to mistreat it, which you were. And to the person who thinks 6 years is a great achievement, goldfish live between 20-30 years when looked after properly, so you have nothing to be proud of. Petco disagrees with you, Emily.